Am I the only one who hasn’t started finished her fall decorating yet? I was starting to think I wasn’t going to have a new fall wreath on our front door at all this year. 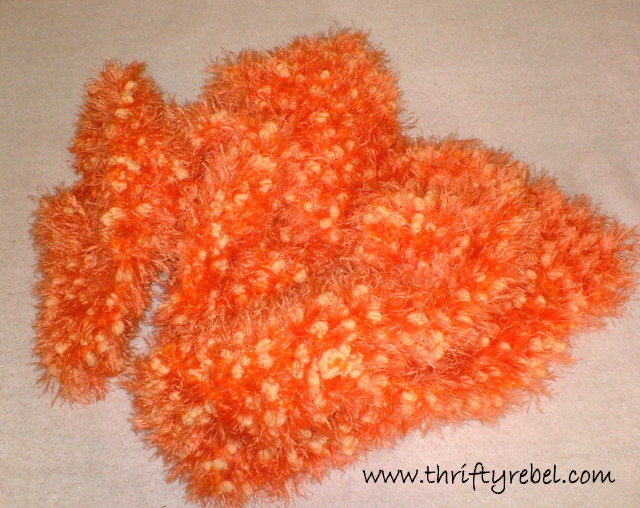 But fate finally intervened and I found this at the thrift store on Thursday… a gorgeous faux pumpkin seed scarf. Yay! And to make it even better they were having a 50 cent sale on hats, mitts, and scarves. Yay! Yay! It smells fantastic, sort of like cherry candy… and those pumpkin seed thingies really do look like pumpkin seeds. I also used this lovely scarf in my repurposed owl fall door decor project. On Friday I took a ME day. 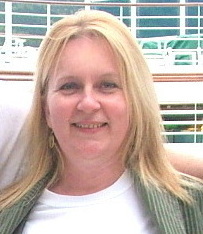 (And no I wasn’t playing hooky, lol… it was a vacation day off work). ME stands for Mine Entirely. Woo hoo!! The whole day… all to myself! Now that I had this fabulous scarf I was on a mission to get my wreath done. I wrapped the scarf around this $1 wreath that I already had… and then I sat and drank a cup of tea while looking out the window… and then I sat with Leo on my lap while looking out the window. Apparently I love looking out the window while thinking about what to do next. My wreath needed a little something more, but it had to be something simple. Well, nothing came to me so I hung it on my craft room door, decided I would think about it tomorrow, and went to play with other projects. 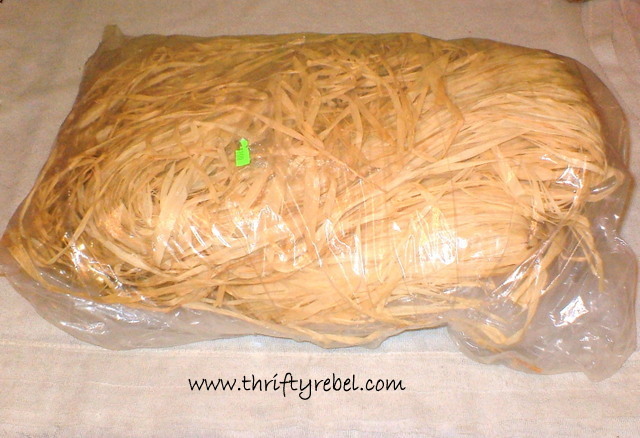 Then I went to the Salvation Army thrift store on Saturday and found this large bag of raffia for $2. Another Yay!!! And here’s what I came up with to finish off the wreath. 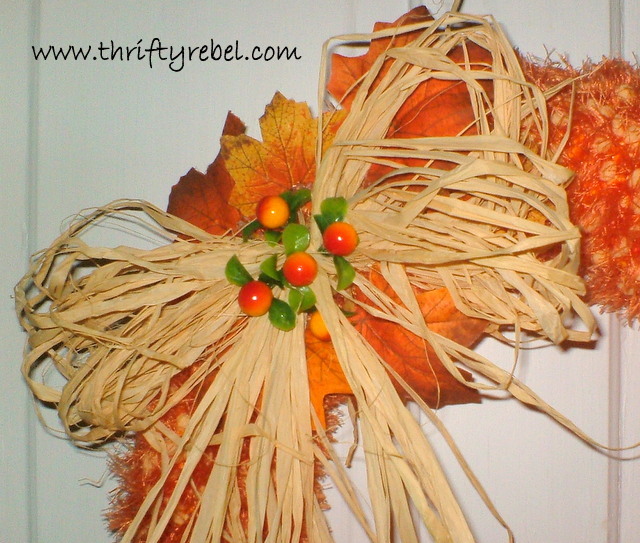 I made a very simple bow out of the raffia, tied it to the wreath using a piece of raffia, tucked some faux leaves in behind, and added a few faux berries. And my new fall wreath is done. A final Yay!! Sometimes, for reasons totally unknown to me, fate decides to shine on me… putting me in the just the right place at just the right time to find just the right things. I hope fate shines on you today, thanks so much for reading! Btw I live the new look!! 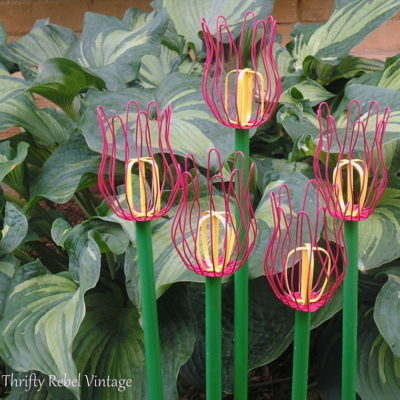 You really manage to do amazing things with what you find. Such a lovely wreath! 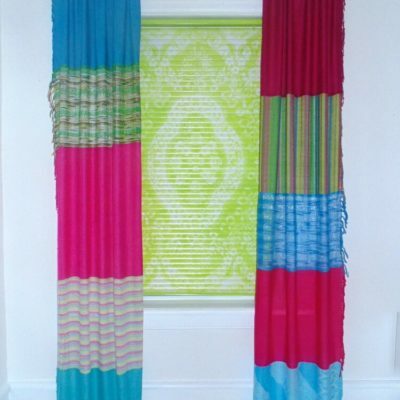 So unusual using the pumpkin seed scarf! 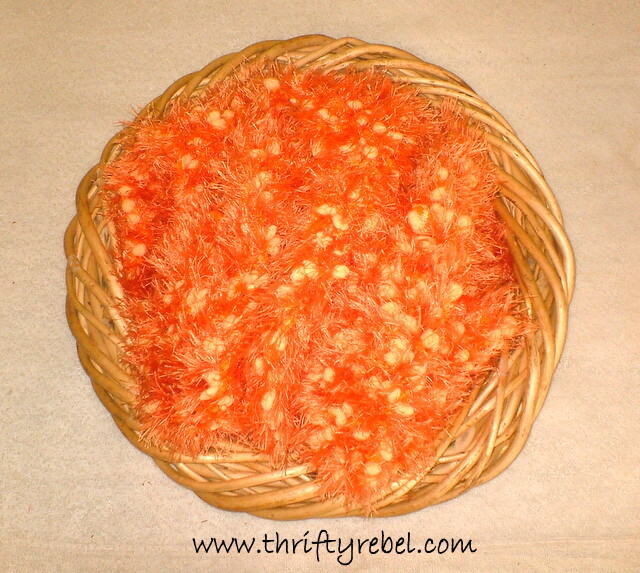 Love the bright orange color and adding the raffia bow really offsets it all! Beautiful! What a fabulous find and of course, you knew just what to do with it! I love it Tuula and I'm telling Suzan you made another wreath!! I never think of scarves! Very cool! That scarf looks so soft and comfy! Can I wear the wreath around my neck?? Your wreath came out beautiful! 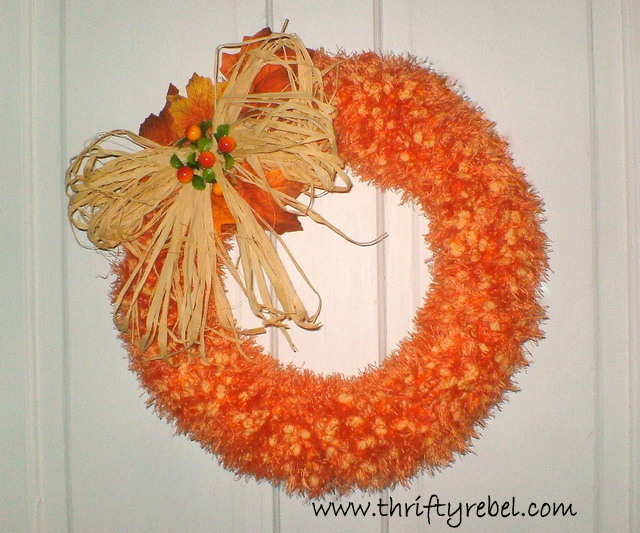 This is a really cool wreath! Love the bow. What a beautiful wreath and a wonderful and creative way to spend your ME day. I was going to guess it was made out of a boa…I was close. But, I never would have guessed how frugally you made this. Beautiful! Wow Tuula. What a great find and especially around Halloween! You created a fantastic wreath. Love it! First, I love this new look you have going here on the blog. I knew it was time for you to find one of those scarves and make something out of it. It does look just like pumpkin seeds. Looking out the window is a favorite activity of mine also! I like to think a lot. Hi, I really love this wreath you made! It is always fun finding things in the thrift store and boy were you creative in making this. I love it. Happy Halloween and I saw it on I gotta create. Thanks so much Julie! I was really lucky to find such a beautiful scarf with fall colour. The rest was easy. Thanks for popping by! 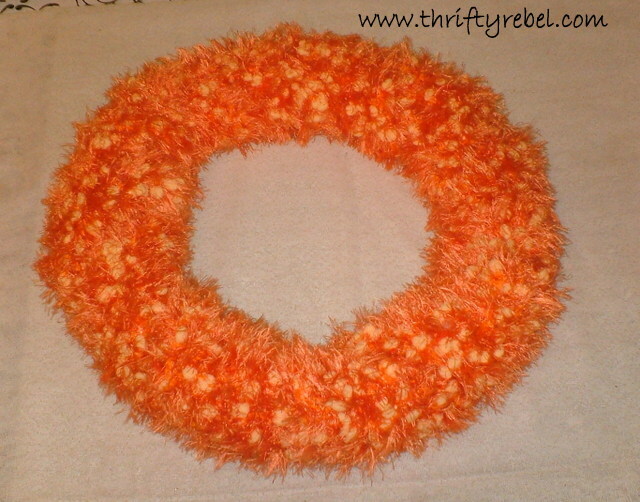 That scarf makes the cutest wreath! You have given me some great ideas now! Thanks for linking to TTF! 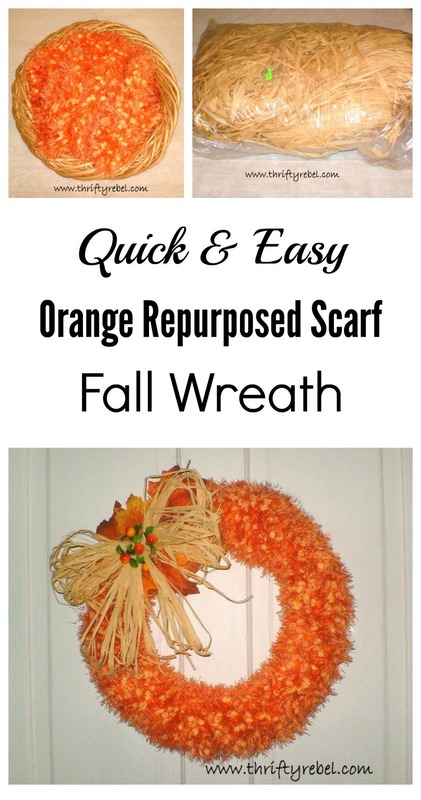 This wreath is so cute and I love how it came to be…so creative! Seriously! You are amazing! This looks fabulous. Thanks for linking up to Tickled Pink Times Two. I have never seen a scarf like that! Thank you so much for sharing your neat wreath at Twirl & Take a Bow–hope to see you again this week!